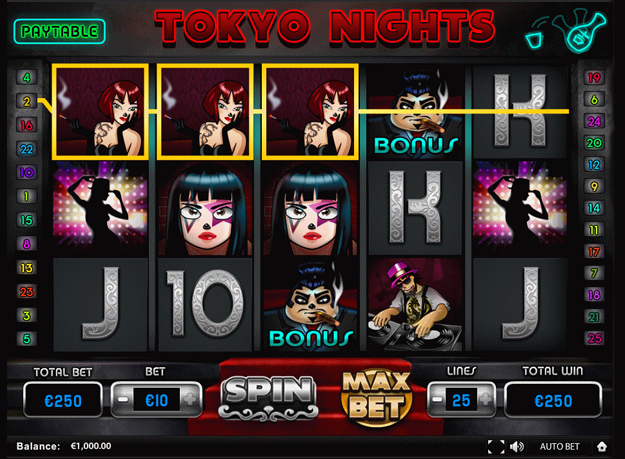 Meet the characters of the night in Tokyo Nights Slots at Gossip Bingo. Roam the streets as you enjoy fun bonuses, guaranteed wins FREE spins and more! But be sure to watch out for the Dragon! Good luck! How do the streets of Tokyo sound for an evening stroll? Get ready to enter the underworld in Tokyo Nights Slots, one of the hottest 5 reel and 25 payline online slot game at Gossip Bingo. There are rewarding bonuses with guaranteed wins every time, FREE spins and multiplied wins. But with the good, unfortunately comes the bad as well, so you better watch out for the Dragon because you definitely don't want to start a shootout and have to steer clear of stray bullets flying across your reels.